I've noticed something as I get older. When I run on the treadmill, I'm sore the next day...unless I stretch really well. In the past, I could play a full 90 minutes of soccer plus overtime in the snow and just walk off the field afterward... no soreness the next day. Sadly, those days are over. Now, if i don't stretch regularly, I'll likely pull something when I try to really exercise. I think the same is true of us mentally/philosophically/spiritually. As I get older (and I notice this in others also believe it or not), I sense a tendency toward being brittle in what I believe, the practices I deem acceptable, and my perceptions of what is truth. I'm more inclined to quickly dismiss new ideas, afraid of them, because they may stretch me too far and hurt me. However, if I'm regularly stretching myself (by reading/considering/dialoguing/listening to ideas/books/people i don't necessarily agree with), I find it much easier to engage the more difficult issues that come down the pike. Perhaps this is one reason the Bible encourages us so often to be listeners. Listening stretches us and keeps us limber. If I want to remain flexible and avoid becoming an old curmudgeon (I'm well on my way), I must find voices with whom I disagree and then listen to them. I'm not necessarily listening so I can change. I'm absolutely not listening so I can argue. I'm listening simply to understand, to see their point of view, to add their perspective to my own. You can listen to podcasts, sermons, audio books. You can listen by reading articles, blog posts, books and even your twitter feed (do you only follow people who are exactly like you?). You can listen by inviting someone to coffee and then... listening to them. Flexibility keeps us from breaking when the stress of life becomes overwhelming. 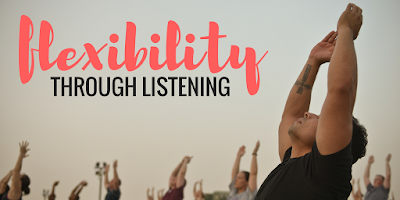 Work on your flexibility today by listening to a new voice. Is it even possible to find or know God? Do Amazing Things. All You Need Is A Stick.